The Academy Awards suddenly turned into the Michelle Obama Oscars when Jack Nicholson told the audience a special guest was joining him to present Best Picture. "Argo" won the award, which the First Lady read off an envelope while being paged in to Los Angeles' Dolby Theatre. "[These films] taught us that love can beat all odds," Obama said. "They reminded us that we can overcome any obstacle if we dig deep enough and fight hard enough and find the courage within ourselves." It's through cinema, Obama said, that "our children learn to open their imagination and dream just a little bigger and to strive every day to reach those dreams." "Argo's" win was remarkable because it was only the fourth film in the Oscars' 85-year history to win Best Picture without a corresponding Best Director nomination. Affleck, a producer on the film, gave an emotional acceptance speech that ended with a simple message: "It doesn't matter how you get knocked down in life, all that matters is how you get back up." More on the Oscars is available in our further coverage and in the live blog that follows the below gallery. That's all from the Oscars 2013 live blog here at HuffPost Entertainment! Hope you enjoyed the show. This is Christopher Rosen, signing off. When did you feel a tipping point in your favor for this film? Ben: When they gave us the trophies I was confident that we would win. I don’t get too much into the Oscar-ology and the pontificating. It doesn’t help me to read up on that stuff. Was it uncomfortable wearing the beard? What do you mean? No it's just a beard. Do you wear your hair? It was my very own beard. "A bad word. That starts with F."
More on Patricia Clarkson's look here. Here's Awards Daily blogger Sasha Stone just after "Argo" won Best Picture. See, I told you Argo was Crash incarnate. Won the same amount of awards even. Have you ever seen a movie where you walk out saying, “That was just a great f--king movie”? That’s Ben Affleck’s Argo. Inexplicably, a film that draws its strength from humor and suspense, winds up being more moving the second time through. Perhaps because once you have been through the suspense part of it you get to know the characters better and therefore care about their outcomes more. 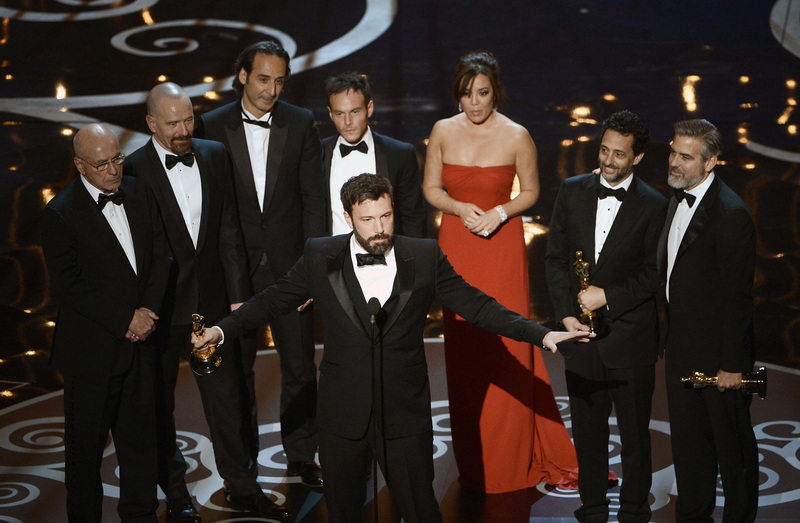 Affleck: Oscar winner to laughingstock to Oscar winner. You can't make these things up. More on Daniel Day-Lewis' Oscar speech here.